The term digital divide refers to the gap between people with effective access to digital and information technology and those with very limited or no access at all. It includes the imbalances in physical access to technology as well as the imbalances in resources and skills needed to effectively participate as a digital citizen. In other words, it is the unequal access by some members of society to information and communications technology, and the unequal acquisition of related skills. The term global digital divide refers to differences in technology access between countries or regions of the world. Various organizations and institutions including the United Nations, the United States Agency for International Development (USAID), the IMARA organization (from the Swahili word for "power") at the Massachusetts Institute of Technology, and a number of others seek to close the gap. These groups offer assistance in various forms, which range from the donation of computer hardware and software to establishing information infrastructures. The open source movements also seek to address the digital divide. The digital divide is taken seriously since it can widen the existing gap between advanced countries and developing countries, which affects a whole range of social life from education to business, research, communication, and others. The term initially referred to gaps in ownership of computers between groups, during which time the increase of ownership was limited to certain ethnic groups. The term came into regular usage in the mid-1990s, though the term had previously appeared in several news articles and political speeches as early as 1995. President of the United States Bill Clinton and his Vice President Al Gore used the term in a 1996 speech in Knoxville, Tennessee. Larry Irving, a former United States head of the National Telecommunications Infrastructure Administration (NTIA) at the Department of Commerce, Assistant Secretary of Commerce and technology adviser to the Clinton Administration, noted that a series of NTIA surveys were “catalysts for the popularity, ubiquity, and redefinition” of the term, and he used the term in a series of later reports. Since the start of the George W. Bush Administration, the NTIA reports have tended to focus less on gaps and divides and more on the steady growth of broadband access, especially amongst groups formerly believed to be on the wrong side of the digital divide. There is considerable literature on information and digital inequality that predates this current label. The concept of a digital divide is more of a new label and less of a unique concept. The term initially referred to gaps in the ownership of, or regular access to, a computer. As Internet access came to be seen as a central aspect of computing, the term's usage shifted to encompass gaps in not just computers but also access to the Internet. Recently, some have used the term to refer to gaps in broadband network access. The term can mean not only unequal access to computer hardware, but also inequalities between groups of people in the ability to use information technology fully. Due to the range of criteria which can be used to assess the imbalance, and the lack of detailed data on some aspects of technology usage, the exact nature of the digital divide is both contextual and debatable. Criteria often used to distinguish between the 'haves' and the 'have nots' of the digital divide tend to focus on access to hardware, access to the Internet, and details relating to both categories. Some scholars fear that these discussions might be discouraging the creation of Internet content that addresses the needs of minority groups that make up the "have nots," as they are portrayed to be technophobic charity cases that lack the desire to adopt new technologies on their own. One area of significant focus was school computer access; in the 1990s, rich schools were much more likely to provide their students with regular computer access. In the late 1990s, rich schools were much more likely to have Internet access. In the context of schools, which have consistently been involved in the discussion of the divide, current formulations of the divide focus more on how (and whether) computers are used by students, and less on whether there are computers or Internet connections. The E-Rate program in the United States (officially the Schools and Libraries Program of the Universal Service Fund), authorized in 1996 and implemented in 1997, directly addressed the technology gap between rich and poor schools by allocating money from telecommunications taxes to poor schools without technology resources. Though the program faced criticism and controversy in its methods of disbursement, E-Rate has been credited with increasing the overall number of public classrooms with Internet access from 14 percent in 1996 to 95 percent in 2005. Recently, discussions of a digital divide in school access have broadened to include technology related skills and training in addition to basic access to computers and Internet access. 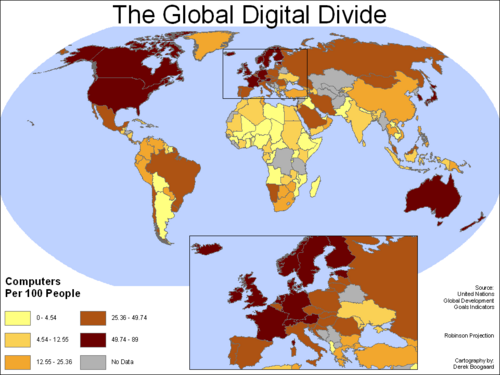 Another key dimension of the digital divide is the global digital divide, reflecting existing economic divisions in the world, which can clearly be seen in The Global Digital Divide image below. This global digital divide widens the gap in economic divisions around the world. Countries with a wide availability of Internet access can advance the economics of that country on a local and global scale. In today's society, jobs and education are directly related to the Internet, in that the advantages that come from the Internet are so significant that neglecting them would leave a company vulnerable in a changing market. “Andy Grove, the former chair of Intel, said that by the mid-2000s all companies will be Internet companies, or they won’t be companies at all.” In countries where the Internet and other technologies are not accessible, education is suffering, and uneducated people and societies that are not benefiting from the information age, cannot be competitive in the global economy. This leads to these countries, which tend to be developing countries, suffering greater economic downfall and richer countries advancing their education and economy. However, when dealing with the global aspect of digital divide there are several factors that lead to digital divide. For example, country of residence, ethnicity, gender, age, educational attainment, and income levels are all factors of the global aspects of digital divide. In addition, a survey shows that in 15 Western European countries females, manual workers, elderly, and the less educated have less Internet access than males, professional, the young, and the well educated.” The digital divide is a term used to refer to the gap between people who have access to the Internet and those that do not. It can also refer to the skills people have – the divide between peoples who are at ease using technology to access and analyze information and those who are not. Canada: According to an Autumn 2007 Canadian Internet Use Survey, 73 percent of Canadians aged 16 and older went online in the 12 months prior to the survey, compared to 68 percent in 2005. In small towns and rural areas, only 65 percent of residences accessed the Internet, compared to 76 percent in urban areas. The digital divide still exists between the rich and the poor; 91 percent of people making more than $91,000/year regularly used the Internet, compared to 47 percent of people making less than $24,000. This gap has lowered slightly since 2005. China: China is the largest developing country in the world and therefore saw their Internet population grow by 20 percent in 2006. However, just over 19 percent of Chinese people have access to the Internet and the digital divide is growing due to factors such as insufficient infrastructure and high online charges. See Digital divide in the People's Republic of China for more information. Europe: A European Union study from 2005 conducted in 14 European countries and focused on the issue of digital divide found that within the EU, the digital divide is primarily a matter of age and education. Among the young or educated the proportion of computer or Internet users is much higher than with the old or uneducated. Digital divide is also higher in rural areas. The study found that the presence of children in a household increases the chance of having a computer or Internet access, and that small businesses are catching up with larger enterprises when it comes to Internet access. The study also notes that "Despite increasing levels of ICT usage in all sections of society, the divide is not being bridged." United States: According to a July 2008 Pew Internet & American Life report, “55% of adult Americans have broadband Internet connections at home, up from 47% who had high-speed access at home last year at this time .” This increase of 8 percent compared to the previous year’s increase of 5 percent suggests that the digital divide is decreasing. However, the findings go on to show that low-income Americans’ broadband connections decreased by 3 percet. Therefore, the detailed income groups need to be considered. Digital divide is a common subject in United States politics and various government policies. The theoretical concepts of e-democracy are still in early development, but many scholars agree that blogs (web logs), wikis and mailing lists may have significant effects in broadening the way democracy operates. There is no consensus yet among scholars about the possible outcomes of this revolution; it has so far shown promise in improving electoral administration and reducing fraud and disenfranchisement; particularly positive has been the reception of e-government services related to online delivery of government services, with portals (such as United States USA.gov in English and GobiernoUSA.gov in Spanish) used as intermediaries between the government and the citizen, replacing the need for people to queue in traditional offices. One of the main problems associated with the digital divide as applied to a liberal democracy is the capacity to participate in the new public space, the cyberspace—as in the extreme case, exclusively computer-based democratic participation (deliberation forums, online voting, etc) could mean that no access meant no vote. Therefore, there is a risk that some social groups—those without adequate access to or knowledge of IT—will be under-represented (or others over-represented) in the policy formation processes and this would be incompatible with the equality principles of democracy. Proponents of the open content, free software, and open access social movements believe that these movements help equalize access to digital tools and information. Projects like One Laptop per Child and 50x15 offer a partial solution to the global digital divide; these projects tend to rely heavily upon open standards and free open source software. The OLPC XO-1 is an inexpensive laptop computer intended to be distributed to children in developing countries around the world, to provide them with access to knowledge. Programmer and free software advocate Richard Stallman has highlighted the importance of free software among groups concerned with the digital divide such as the World Summit on the Information Society. Organizations such as Geekcorps, EduVision and Inveneo also help to overcome the digital divide. They often do so through the use of education systems that draw on information technology. The technology they employ often includes low-cost laptops/subnotebooks, handhelds (e.g. Simputer, E-slate, ...), tablet PCs, Mini-ITX PCs and low-cost WiFi-extending technology as cantennas and WokFis. In addition, other information technology material usable in the classroom can also be made diy to lower expenses, including projectors. In Digital Nation, Anthony G. Wilhelm calls on politicians to develop a national ICT agenda. International cooperation between governments have begun, aiming at dealing with the global digital divide. For example, in an attempt to bridge this digital divide, an agreement between the United States Agency for International Development (USAID) and the Egyptian government emerged. The USAID funded state-of-the-art equipment for Egyptian education, their brilliance of knowledge in using such equipment caused such equipment to increase in use throughout the years. Now, Egyptian society is more computer literate and knowledgeable about computers than they used to be. Nonetheless it's a sign of progress that such attempts at bridging the digital divide are seriously being made. Additional participants in such endeavors include the United Nations Global Alliance for ICT and Development and the Digital alliance Foundation. The United Nations is aiming to raise awareness of the divide by way of the World Information Society Day which takes place yearly on May 17. It also set up the Information and Communications Technology (ICT) Task Force in November 2001. Each year, Certiport (which focuses on teaching digital literacy) awards the Champions of Digital Literacy award to leaders, world-wide, who have helped to close the digital divide in their native countries. The existence of a digital divide is not universally recognized. Compaine (2001) argues it is a perceived gap. Technology gaps are relatively transient; hence the digital divide should soon disappear in any case. The knowledge of computers will become less important as they get smarter and easier to use. In the future people will not need high-tech skills to access the Internet and participate in e-commerce or e-democracy. Thus Compaine argues that a digital divide "is not the issue to expend substantial amounts or funds nor political capital." ↑ Carrie Bickner, Down By Law. Under heading Closing the Digital Divide. Retrieved February 11, 2009. ↑ 3.0 3.1 Kate Williams, What is the digital divide?, working paper, University of Michigan, 2001. Retrieved February 11, 2009. ↑ Eleventh Paragraph Remarks by President Clinton, October 10, 1996. The Clinton Presidential Center Web Site Online Archives. Retrieved February 11, 2009. ↑ Falling Through The Net: A Survey of the "Have Nots" in Rural and Urban America, 1995, U.S. Department of Commerce. Retrieved February 11, 2009. ↑ Falling Through the Net II, 1998, Retrieved February 11, 2009. ↑ Falling Through the Net, 1999, and Falling Through the Net, 2000, U.S. Department of Commerce. Retrieved February 11, 2009. ↑ A Nation Online: Internet Use in America, 2002, U.S. Department of Commerce. Retrieved February 11, 2009. ↑ A Nation Online: Entering the Broadband Age, 2004. U.S. Department of Commerce. Retrieved February 11, 2009. ↑ Internet Access Soars in Schools, But "Digital Divide" Still Exists at Home for Minority and Poor Students, October 29, 2003. US Department of Education. Retrieved February 11, 2009. ↑ Computer and Internet Use by Children and Adolescents in 2001, October 2003. National Center for Education Statistics. Retrieved February 11, 2009. ↑ "New Report Shows How E_Rate is Connecting Communities and Schools to 21st Century Academic and Employment Opportunities", National Coalition for Technology in Education and Training, Washington, DC, February 28, 2007. Retrieved February 11, 2009. ↑ Eisa, Ahmed. Gedaref - Sudan Smart Schools for bridging the Digital Divide, Digital Divide Network. February 5th, 2007. Retrieved February 11, 2009. ↑ Michael R. Burks, "Economic Factors Involved with Universal Internet Access and People with Special Needs - A Working Paper", Internet Fiesta, March 1-2, 2001, Sofia, Bulgaria. Retrieved February 11, 2009. ↑ Canadian Internet Use Survey, June 12, 2008. Statistics Canada. Retrieved February 11, 2009. ↑ James Spencer, The Growth of the Chinese Internet market, ChinaSearchAds.com. Retrieved February 11, 2009. ↑ The World Factbook, CIA., February 2009. Retrieved February 11, 2009. ↑ The digital divide in Europe, number 38/2005, Eurostat, European Commission. Retrieved February 11, 2009. ↑ Horrigan, Home Broadband Adoption 2008 Report Retrieved February 11, 2009. ↑ 28.0 28.1 See various papers collected in Peter Shane, Democracy Online: The Prospects for Political Renewal Through the Internet, Routledge, 2004, ISBN 0415948657. Retrieved February 11, 2009. ↑ 29.0 29.1 Kieron O'Hara and David Stevens, Inequality.com, 2006, Oneworld, ISBN 1851684506, 300-301. Retrieved February 11, 2009. ↑ Francis Raven, Organizing With Open Source, September 13, 2005. Digital Divide Network. Retrieved February 11, 2009. ↑ Max Ward, Portables to power PC industry, BBC. Thursday, September 27, 2007, 07:43 GMT 08:43 UK. Retrieved February 11, 2009. ↑ Ciarán O’Riordan, Transcript of RMS at WSIS on “Is Free/Open Source Software the Answer?”, Fellowship of Free Software Foundation Europe. Retrieved February 11, 2009. ↑ Inveneo as organization addressing digital divide, INVENEO. Retrieved February 11, 2009. ↑ Geekcorps using Mini-ITX PCs. IESC GEEKCORPS. Retrieved February 11, 2009. ↑ DIY lcd projector. Retrieved February 11, 2009. ↑ DIY lcd and lightbulb projectors. Retrieved February 11, 2009. ↑ Mark Warschauer, Reconceptualizing the Digital Divide, First Monday, July 31, 2002. Retrieved February 11, 2009. ↑ The Global Alliance for Information and Communication Technologies and Development (GAID). Retrieved February 12, 2009. ↑ The Digital Alliance Foundation. Retrieved February 12, 2009. ↑ 17 May - World Information Society Day. From portal.unesco.org. Retrieved February 12, 2009. ↑ United Nations Information and Communication Technologies Task Force. Retrieved February 12, 2009. ↑ IMARA Project at MIT. Retrieved February 12, 2009. ↑ Champions of Digital Literacy Hall of Fame. CERTIPORT. Retrieved February 12, 2009. Fizz, Robyn and Karla Mansur. 2008. "Helping MIT neighbors cross the 'digital divide'", MIT Tech Talk: 3, Cambridge: MIT. Retrieved February 11, 2009. Horrigan, John B. "Home Broadband Adoption 2008 Report", Pew Internet & American Life. Retrieved February 11, 2009. Rice, Ronald. “Primary Issues in Internet Use: Access, Civic and Community Involvement, and Social Interaction and Expression” In Handbook of New Media. L. Lievrouw & S. Livingstone, 2002. Stallman, Richard. October 6, 2006. "Transcript of Richard Stallman's speech at World Summit of the Information Society (WSIS) on "Is Free/Open Source Software the Answer? "", Fellowship of Free Software Foundation Europe. Retrieved February 11, 2009. Young, Jeffrey R. November 9, 2001. "Does 'Digital Divide' Rhetoric Do More Harm Than Good?" The Chronicle of Higher Education 48: 1-5. Retrieved February 11, 2009. Chapter 2. Bridging the digital divide, World Information Society Report 2007, International Telecommunication Union, United Nations Conference on Trade and Development. 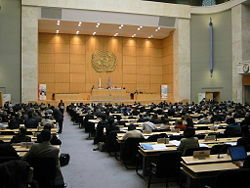 International Telecommunication Union (ITU), Geneva. 2007. Retrieved February 11, 2009. InterConnection – a non-profit organization that works to reduce the digital divide, providing refurbished computers, laptops, and technologies to schools, NGOs, and other organizations in developing countries throughout the world. UK Online Centres – gives UK Internet access to the "digitally deprived"
Close the Gap – an international not-for-profit organization that helps bridging the digital divide in the world by offering cost-efficient high quality refurbished computers to socio-educational projects such as schools, hospitals and other programs focusing on improvement of educational and information facilities. Telecom use at the Bottom of the Pyramid in Emerging Asia, LIRNEasia. This page was last modified on 23 October 2017, at 19:37.